Why are Russian metals companies withdrawing from the U.S. and Europe? In expectation of new Western sanctions, Russian metals companies are quitting the U.S. and European markets and are gradually focusing on Asia. As a result, it is the metals industry that is becoming one of the first sectors in Russia to shift its focus from Western countries to Asia, while in the EU and the U.S. thousands of people may lose their jobs. In April 2014, one of Russia's major holding companies, the mining and metals firm Mechel, suspended the operation of its subsidiary, Bluestone, in the U.S. state of West Virginia. The decision came against the backdrop of threats by the U.S. administration to introduce sanctions against whole sectors of the Russian economy, however Mechel itself denies any link to politics. "The board of directors has decided to focus on those assets where we have maximum competitive advantage and divest non-core ones. Since then we have sold plants in Romania, the UK, Bulgaria, and Kazakhstan," a company spokesperson told RBTH. In the mining segment of the business, the company is concentrated on its key investment project, the Elgin deposit of coking coal in the south of Yakutia (in Siberia), largely aimed at consumers in Asia. Another Russian giant, the Novolipetsk Metals Combine (NLMK), owned by Russia's fourth richest man according to Forbes, Vladimir Lisin (worth $16.6 billion), sent a letter to the European Commission in March 2014, warning that EU sanctions against Russia would have disastrous consequences for the European steel industry. In particular, the Russian company said that if new sanctions are introduced that force NLMK to suspend its operations in Europe, they would interrupt steel supplies to key European consumers that manufacture construction machinery, automobiles and equipment for the electricity sector. The Russian company produces rolled steel that is used, among other things, to manufacture wind turbines and ships in Northern Europe, NLML spokesman Sergei Babichenko told RBTH. At the moment, the company's six plants, in Denmark, Italy, France and Belgium, employ 2,530 people. Some 10,000 more jobs have been created at businesses forming the company's chain of suppliers and auxiliary productions. In 2013 alone, NLMK allocated 270 million euros to support these enterprises. When that support is no longer there, those enterprises will face bankruptcy and mass layoffs. “At the time it seemed that our metals companies were buying everything that was on offer,” she added, noting that the leaders in that trend were the companies Severstal and Evraz. Severstal's biggest deals were the acquisition of the coal business of PBS Coals Corporation in Canada for $1.3 billion and the steel company Esmark Incorporated in the U.S. for $800 million. Evraz's most expensive buys were the U.S. companies Ipsco and Oregon Steel Mills, acquired for record-breaking $4 billion and $2.3 billion deals respectively. However, since then the market situation has changed dramatically and metals companies have faced some challenges. "Many of them, due to an extremely unfavorable market situation and aggressive acquisitions in the past, operate under an unmanageable loan debt burden. As a result, some of the assets acquired in the mid-2000s have now been put up for sale," said Gapon. On May 12, the Wall Street Journal reported that Severstal was accepting bids for its U.S. operations and estimated that the sale of the assets could bring the Russian company as much as $1.5 billion. Gapon added that financial sanctions introduced by the EU and the U.S. would further exacerbate the financial woes of metal companies. Russian metals companies themselves are denying any link between the possible closure of enterprises in the U.S. and the EU and possible EU and U.S. sanctions; however they are actively transferring their operations to the Russian market or Asian countries. "Over the past couple of years, Russian metals companies have been redirecting part of their sales from export markets towards domestic consumers, and sanctions would only escalate this process," says economist Vladislav Grinko, a professor at the Institute of Natural Monopolies under the Russian Presidential Academy of National Economy and Public Administration. 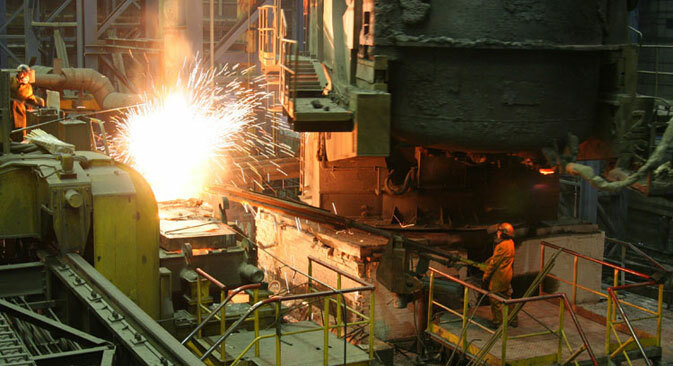 For example, export supplies from the Magnitogorsk Iron and Steel Works (MMK) in 2013 dropped by 35 percent. That had largely to do with the company's strategy aimed at increasing sales on the Russian and the CIS markets, the company's press service told RBTH. Furthermore, MMK's export supplies mainly went to the Middle East (55 percent), with Europe accounting for just 5 percent of last year's output. For its part, Mechel, according to a company spokesperson, now mainly trades with Asian countries. "The main consumers of our mining products are Asian-Pacific countries. In the first nine months of 2013, we sold some 40 percent of our coking coal concentrate to China, with Europe receiving just 14 percent," a company spokesperson said. If this trend continues, Russian metals companies will become the first sector of the country's economy to shift its focus from Europe and the U.S. to Asian countries and the domestic market.